There are many causes of chest pain or that burning sensation in chest. Luckily, most of them are not severe and can easily be treated. In most cases, especially the first time, people do not understand why they get a burning feeling in chest. In this case, they may suspect heartburn, peptic ulcer or even heart attack. If you experience a burning sensation in the chest, visit your doctor for diagnosis and treatment. However, if you are experiencing serious pain accompanied by other symptoms, you might need emergency help. Now let's take a close look at the main causes. Burning Sensation in Chest: Is It Heartburn or Heart Attack? Mostly burning pain in chest is a result of acid reflux, though it is normal to worry about a heart attack. Here are symptoms of both heartburn and heart attack that can help differentiate them. This inflammation can destroy the tissues of the tube that carries foods from the mouth to the stomach (esophagus). It can cause chest pain and difficulties in swallowing. Esophagitis is caused by allergies, oral drugs, infection and stomach acid moving up the esophagus. For young babies, especially those unable to express themselves, they may have feeding problems or failure to grow well. Treatment for esophagitis depends on the cause of the inflammation. OTC and prescribed medicines like antacids and medications reducing or blocking acid production like H-2-receptor blockers may be helpful. 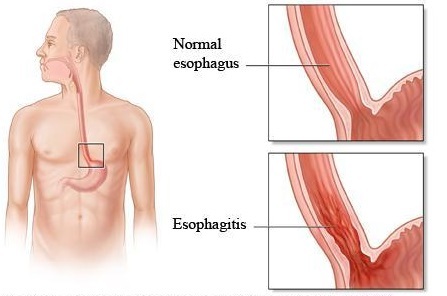 Surgical separation of the stomach and esophagus by wrapping up the portion of esophagus around the valve can provide relief in more severe cases. 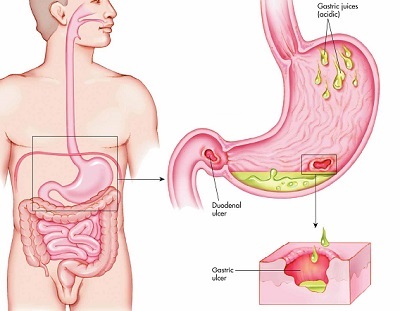 These are open wounds that occur in the stomach (gastric ulcers), the esophagus (esophageal ulcers) and upper portion of small intestines (duodenal ulcers). They are caused by some drugs and bacterial infections and not by stress and spicy diet. Treatment depends on causes but you can use antibiotics for 2 weeks to decrease stomach acid. Besides, medications, like proton pump inhibitors helping reduce stomach acid production, histamine (H-2) blockers helping limit the amount of stomach acid in the digestive tract, antacids helping neutralize extra stomach acid, and other medications helping protect and heal digestive tract, can provide great relief. Your diaphragm has a small opening where the esophagus passes (hiatus). In some cases, the stomach pushes up through this opening. Mostly you will not feel anything because a small hiatal hernia causes no problems. However, large hiatal hernia can allow acid and food back to the esophagus giving your burning sensation in chest. For treatment, you can use medications like antacids, H-2-receptor blockers or proton pump inhibitors to reduce stomach acid. Sometimes, surgery may be needed, via making a small opening in the diaphragm, to pull stomach down to the abdomen and restructure your weak esophageal sphincter or remove your hernia sac.